Pictured above: MBARI midwater research has shed light on the physiology, reproduction, and feeding habits of the vampire squid, an ancient animal that shares characteristics with both squid and octopods. Prior to the creation of MBARI, no ROV-based midwater research program had ever been attempted. When both MBARI remotely operated vehicles reached milestone dives in 2017—4,000 dives for Ventana and 1,000 for the newer Doc Ricketts—the records marked more than the longevity of important oceanographic tools. They represented a serious commitment to the exploration and study of the ocean midwaters, because roughly a quarter of those dives were made for research in that vast habitat between the ocean’s sunlit upper layers and the dark floor of the deep sea. This ongoing investment in remotely operated vehicles and access to the ocean has resulted in unprecedented advances in the understanding of the animals and communities of Earth’s largest ecosystem. Knowledge of the animals that live in the midwater—Earth’s largest ecosystem—is essential for a greater understanding of the health of the world ocean and our stewardship of the ocean’s biota. At MBARI, midwater research and ROV technology are interactive systems that have evolved in tandem and as a result of each other’s changes over 30 years. As the technology has matured, the scope, scale, and complexity of the research has also advanced, particularly in such areas as observing animal behavior and in situ experimentation, which were virtually impossible before scientists gained direct access to this environment. 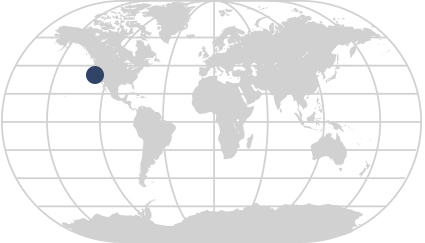 The majority of the Midwater Ecology Group's research has been conducted in Monterey Bay, California, with occasional comparative studies in other locations. New instrumentation enables in situ respiration and fluid dynamics measurements; imaging and data-handling systems build data sets that allow long-term analyses of seasonal, episodic, and human-caused environmental changes; and variable ballast and thruster controls facilitate close-up observations and delicate experimental manipulations without disturbing the animals being studied. The coevolution continues and future developments will focus on integrating diverse sensor systems to give new perspectives for midwater ecology, and on automating research processes to expand the scale of operations, improve efficiency, and promote technology transfer. The Midwater Ecology Group, led by Senior Scientist Bruce Robison, adapted existing tools and made progressive enhancements to allow the collection of specimens for the identification and description of new life forms, a major improvement over the traditional methods that resulted in the destruction of samples as they were brought to the surface. The midwater research program began in 1988 with ROV Ventana, which remains in operation today. In 1997, MBARI developed ROV Tiburon, an electric vehicle with a range of 4,000 meters depth. This vehicle was built in-house and completed more than 1,000 dives from the R/V Western Flyer before it was retired 10 years later. It was replaced by ROV Doc Ricketts, a larger, more powerful vehicle with the same depth range. MBARI’s three work-class ROVs: (a) Ventana as originally configured, in 1988; (b) upgraded Ventana; (c) Tiburon in the test tank; (d) Doc Ricketts launching through the moon pool of the R/V Western Flyer. The first rush of discoveries in midwater was based on observations using a high-resolution video camera coupled to a high-quality 10X zoom lens. The video and lighting systems of the MBARI ROVs have evolved steadily over the years. The overwhelming realization once it became possible to work regularly at mesopelagic depths (the midwater at depths of 200 to 1,000 meters) was that gelatinous animals had been grossly underestimated by conventional midwater sampling methods and that, in general, the biomass of the world ocean’s midwaters had been underestimated by at least a quarter. In addition, it was clear that the midwater realm was far more densely populated, complex, active, and ecologically structured than could have ever been appreciated by traditional methods employing nets and acoustics. The midwater research program has made scientific advances in time series, live animal studies, the understanding of physical changes in the midwater over time, and the behavior, physiology, feeding, and reproduction of animals that live in the deep. During the course of this wide range of studies, the research team also came upon many animals new to science and shared these discoveries with the scientific community as well as the general public. One of the cornerstones of the midwater research program is the time-series study, a project for investigating temporal patterns in the composition and dynamics of the midwater animal community over Monterey Canyon. To conduct these surveys, video is recorded as the ROV is flown at a constant depth and speed for a set period of time, repeated at specific depth intervals. Then MBARI’s Video Annotation and Reference System (VARS) is used to identify and log all of the animals in each video frame, linking those images to related data such as depth, temperature, and oxygen. 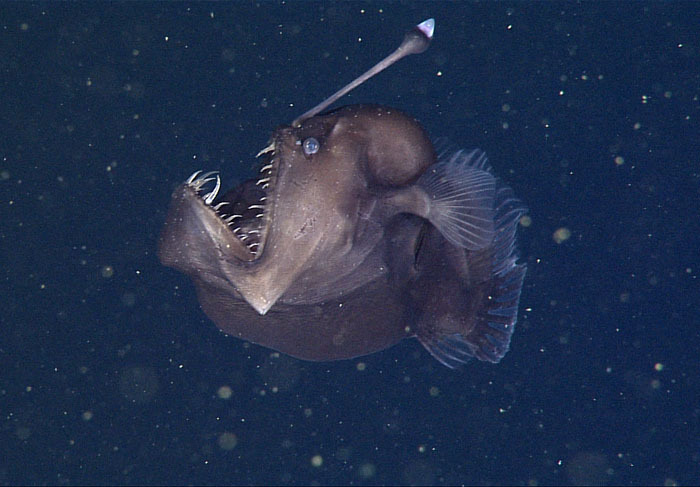 The midwater time series project has yielded a unique 25-year data set of the mesopelagic community in Monterey Bay; there is nothing else like it in the world. Data from the midwater time series have been used in a broad range of studies, such as those showing that giant midwater larvaceans of the genus Bathochordaeus rapidly deliver about one-third of the food necessary to support communities deep on the seafloor of Monterey Bay, through the larvaceans’ discarded filter houses. Time-series data allowed the midwater team to quantify this transport of carbon over a 10-year span and thus to establish that it is an enduring, integral component of the regional deep-sea food web, that had been previously unrecognized. The time-series data also revealed a dramatic change in the presence of the invasive Humboldt squid, Dosidicus gigas. They began appearing in the transects during the El Niño event of 1997-98, disappeared as the waters cooled, then returned again in 2002 and remained for five years. The abundance of Humboldt squid was strongly correlated with a significant decline in the commercially important groundfish, Pacific hake, and with a decrease in the population of the market squid, both presumably due to the Humboldt squid’s voracious appetite. Transporting living animals in pristine condition to shore has led to unprecedented opportunities for experimental work in the laboratory. This would not be possible without the continued improvements in ROV tools to collect live specimens, as well as the proximity of Monterey Canyon to the MBARI laboratories in Moss Landing. 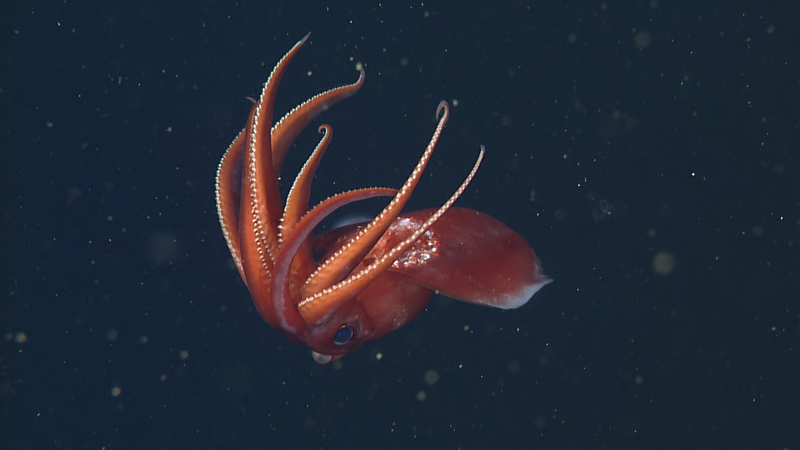 This capability gave rise to several significant advances in our understanding of the biological processes of midwater animals, such as the impact of temperature on siphonophore development, discovering new bioluminescent systems in the vampire squid, and establishing that deep-sea squid species grow more slowly and live longer than their shallow-water counterparts. Transporting living animals in pristine condition to shore has led to unprecedented opportunities for experimental work in the laboratory. This would not be possible without the continued improvements in ROV tools to collect live specimens. MBARI’s ROVs also enable manipulative experimental work to be conducted on live specimens in situ, following the institutional priority to “take the laboratory into the ocean.” In some cases this approach is used to confirm or refute hypotheses that have been tested first in the laboratory ashore. Another approach is to conduct an entire operation at depth with the ROV. For example, the midwater deployment of the Deep Particle Image Velocimetry (DeepPIV) that uses a laser sheet and high-resolution cameras to collect data that, when coupled with the time-series data, showed that the grazing impact of giant larvaceans far exceeds previous estimates for any pelagic filter-feeder. These same tools are being used to investigate how giant larvaceans ingest and disperse plastics through ocean food webs. With ROVs as platforms for observation, the midwater team defined a new discipline of midwater research—animal behavior. The videos collected on some 1,000 dives—with ever-increasing skill on the part of the pilots and scientists and refinements in ROV technology—are a treasure trove of observations of the behavior of deep-sea animals. Highlights of this work are the first published catalogs of observed behavior patterns for any deep pelagic species. Some of the behaviors documented include how squid species from different families all use pigmentation patterns, posture, locomotion, bioluminescence, and inking to communicate visually even in their dark environment. Octopoteuthis deletron, a squid with glowing tips on its arms, in a typical posture at depth. Bioluminescence is just one of the several means that squid use for communication. Midwater surveys below 1,000-meter depths are challenging because of the drag and weight of the armored tether and the need to keep the Western Flyer almost directly above the ROV. As a consequence the team conducted oblique video transects of the pelagic fauna of Monterey Canyon between 1,000 meters and 3,500 meters, for the first-ever quantitative description of a bathypelagic community. These transects revealed a community dominated by gelatinous forms, they documented adaptations in animal behavior and morphology evolved for survival in the dark depths of the ocean, and they led to the discoveries of species not previously known to science. Such discoveries are an inevitable result of exploring the midwater habitat with ROVs. Because our vehicles can be carefully controlled, scientists can observe and collect the most delicate gelatinous animals without disrupting or damaging them. The collections paired with the video observations allow researchers to determine how various body parts fit together and function. The latest new animal description by the Midwater Ecology Group is of Bathochordaeus mcnutti, published in 2017. Feeding interactions and links in the ocean food web are critical for understanding ecosystem structure, function, and energy flow. MBARI’s long-term access to the midwater habitat has yielded a series of publications—including two in 2017—that deal with the feeding patterns of individual species as well as of the midwater community as a whole. 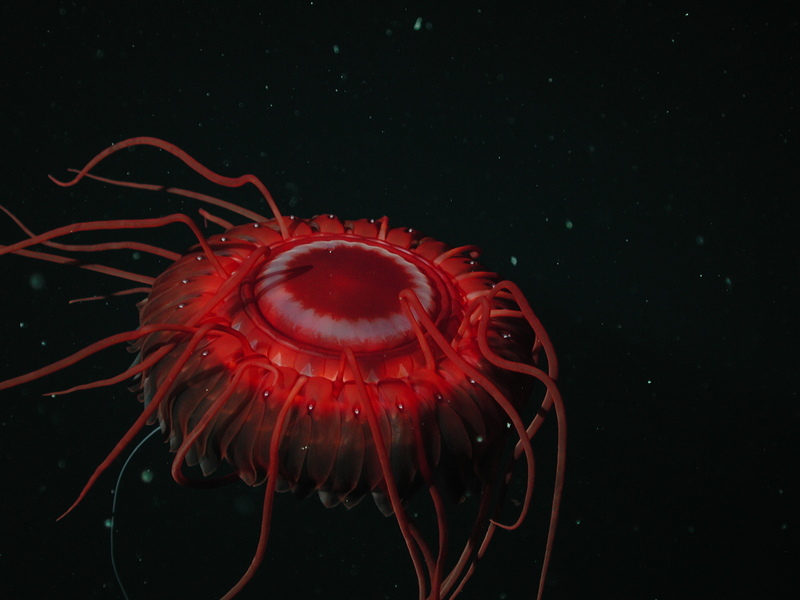 One of the principal ecological advances enabled by our ROVs was the discovery and documentation of an extensive and complex array of gelatinous animals—a “jelly web”—that is now recognized as a significant component of midwater ecosystems worldwide. By analyzing 27-years of video footage collected by remotely operated vehicles, MBARI scientists revealed a food web that is far more complex than previously known, with a dynamic assemblage of jellies, squids, fishes, worms, and crustaceans feeding on one another in a variety of permutations, to sustain life in the deep sea. Multiple observations of feeding by individual species reveal striking differences in the ways that different predators consume the same type of prey. Both the siphonophore Nanomia bijuga and the ctenophore Thalassocalyce inconstans feed on euphausiid krill, but the former uses nematocyst batteries on its tentacles to stun and capture, while the latter gently enfolds the same prey in a soft, sticky lobe. In contrast, the Humboldt squid Dosidicus gigas uses its highly dexterous arm tips to pluck individual krill from the water. A detailed investigation using the VARS database of observations of abundant squids in the genus Gonatus led to surprising results that showed these squids eat their own kind. A much broader searching of the VARS database yielded a detailed description in 2017 of the deep pelagic food web of Monterey Bay. 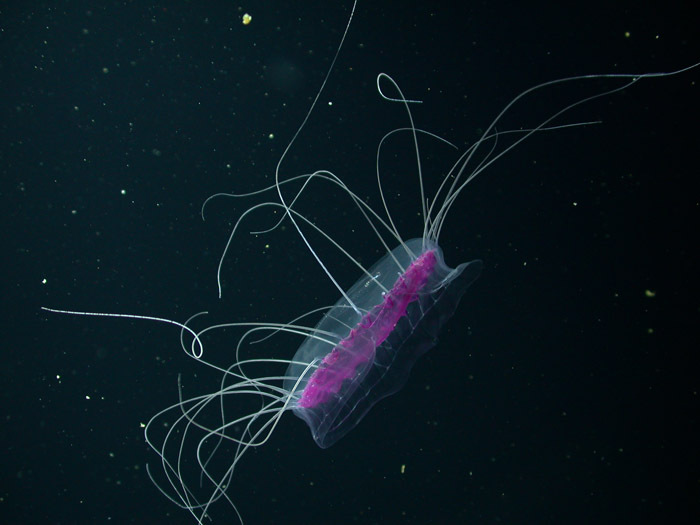 Based on 743 independent feeding observations, the results indicate that jellies are key carnivores and are fully integrated into overall food web structure. 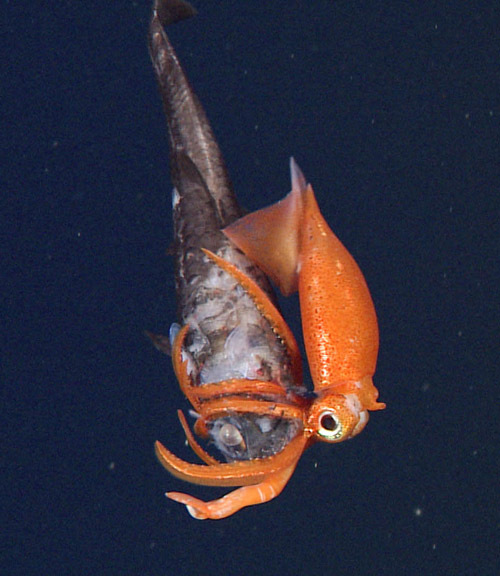 Black-eyed squid *Gonatus onyx* manipulating its prey, the larger owlfish *Bathylagus milleri*, so that it can sever the fish’s spinal cord with its beak to render it immobile for consumption. The ability to make in situ observations has also revealed unanticipated aspects of reproduction among squids. 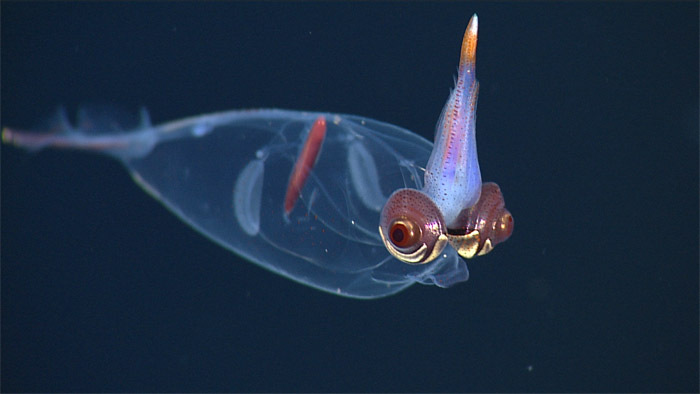 The first case of parental care by a squid was confirmed by ROV Tiburon when it came upon a female Gonatus onyx squid brooding a clutch of 2,000-3,000 eggs at a depth of 2,500 meters. Further research showed that this reproductive mode is common among deep-water squid species. Despite the global significance of deep pelagic animals and the obvious benefits of preserving biodiversity, basic information is still lacking. A long-term goal of MBARI’s midwater research projects is to understand the basic characteristics of midwater community structure and dynamics, such that researchers can identify and model the fundamental ecological components that can serve as a baseline for monitoring and assessing the impacts of climate change. It can also be used to identify appropriate areas for deep pelagic marine protected areas. To reduce the cost of the important midwater time series, MBARI has developed an imaging system mounted on an autonomous underwater vehicle to conduct video transects without a ship or human in attendance. MBARI will share the technology of this less-expensive automated video transecting system with other institutions so they can conduct midwater surveys to suit their interests, or generate comparable data from their own regions, and contrast them with the reference midwater community in Monterey Bay. Choy, C.A., S.H.D. Haddock, and B.H. Robison (2017). Deep pelagic food web structure as revealed by in situ feeding observations. Proceedings of the Royal Society B Biological Sciences, 284. Hoving, H.J.T. and B.H. Robison (2017). The pace of life in deep-dwelling squids. Deep Sea Research Part I: Oceanographic Research Papers. Katija, K., R.E. Sherlock, A.D. Sherman, and B. Robison (2017). New technology reveals the role of giant larvaceans in oceanic carbon cycling. Science Advances, 3: e1602374. Robison, B.H., K.R. Reisenbichler, and R.E. Sherlock (2017). The coevolution of midwater research and ROV technology at MBARI. Oceanography, 30: 26-37. Sherlock, R.E., K.R. Walz, K.L. Schlining, and B.H. Robison (2017). Morphology, ecology, and molecular biology of a new species of giant larvacean in the eastern North Pacific: Bathochordaeus mcnutti sp. nov. Marine Biology, 164: 20. The Midwater Ecology Group is working with MBARI’s Acoustical Ocean Ecology Group to integrate optical and acoustic instruments into a single AUV platform—the holy grail for generations of midwater researchers. MBARI is also working with colleagues from Stanford University and the Woods Hole Oceanographic Institution, with funding from the National Science Foundation, to develop a small, agile autonomous vehicle for further midwater studies. The ocean’s midwaters comprise the largest living space on Earth and within this vast habitat are the planet’s largest and least known major animal communities. MBARI’s midwater ecology projects provide the world’s only community baseline for measuring the effects of climate change on the ecology of the deep water column. The continuing coevolution of our technology and science promises higher resolution, larger scales, and greater precision for understanding the structure and dynamics of these communities—as well as breakthroughs we can only imagine. During MBARI’s early years one of our institutional challenges was “does science drive technology or is it the other way around?” With regard to midwater research we can confidently say that at MBARI, science challenges technology and technology inspires science. Atolla wyvillei, a wide-ranging gelatinous predator that is the next target for our in situ respiration studies with the midwater respirometry system. Multi-institutional study contributes to the understanding of deep-sea canyons and refines methods to study them.